This post is part of the Roth IRA Account Movement happening all across the personal finance blogosphere today. If you have a child, one of the best things you can do for them is to teach them how to be financially savvy and how to save for their future. Even if the kids branch out on their own later and choose to be spendthrifts, they still have the good financial habits you taught them to fall back on. One way you can help your child save for the future is to open a Roth IRA for him. A teenager who has earned income can contribute all of his earnings for the year or the $5,000 Roth IRA yearly maximum contribution limit, whichever amount is less. To prove income, she must either have W-2s issued or keep careful records of the amount she was paid and for which jobs. If she was paid in cash, she must submit a tax return based on her recorded earnings; this will serve as proof of her income. Not all investment firms will open Roth IRAs for children, but there are several that will including Schwab, which only requires a minimum of $100 to open. Some investment firms will require the parent to be the guardian of the account until the child comes of age. Potential of Compounding Interest: If your 14 year old begins doing odd jobs and earning money and investing it in a Roth IRA, she has over 46 years at a minimum for it to grow thanks to the power of compound interest. Option to Withdraw the Contributions: Your child can withdraw the invested balance (but not the accumulated interest) for college expenses or for a down payment on a house at no penalty. If your child is loathe to deposit her entire earnings in a Roth IRA, consider matching her contribution. If she earns $1,500 one year, have her use $750 for Roth IRA contributions and you match her amount so she has the full $1,500 to invest, but still has $750 to spend. Even if you child only deposits a few thousand dollars as a teenager, that amount will grow exponentially. Consider this: if your child invests his $5,000 income in a Roth IRA just once at age 16 but then never invests another penny in his Roth, he will have $217,137 at age 65 assuming an 8% rate of return. Five thousand dollars grows to $217,137! Imagine how much more he would have if he went on to contribute regularly. A 16 year old with $5,000 invested in his Roth who then goes on to invest $3,000 annual until he retires at age 65 will have $1,935,448 at retirement. When your child applies for financial aid, his Roth IRA may be considered as his asset and therefore included in the calculation of his need for financial aid. 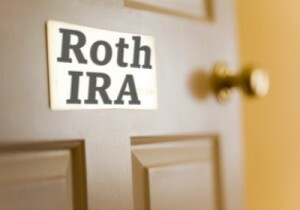 You may want to speak with a professional about this before opening a Roth IRA. While convincing a child to invest in a retirement account may be a hard sell, the rewards are well worth doing so. As soon as my son is old enough to earn his own money, we plan to open a Roth IRA for him.